Curb appeal is a buzzword you have probably heard in the last few years. It refers to how your home looks from the road. Good curb appeal will positively impact a visitor’s impression of your home. Whether you plan to keep your home or you are looking to sell in the near future, good curb appeal is important. So when you make changes to the exterior of your home always consider what design elements or custom options you can add to the project. They might seem unimportant or unnecessary but you would be surprised at how much a few extras can do for the appearance of your home. They add an element of style and individuality to the project. 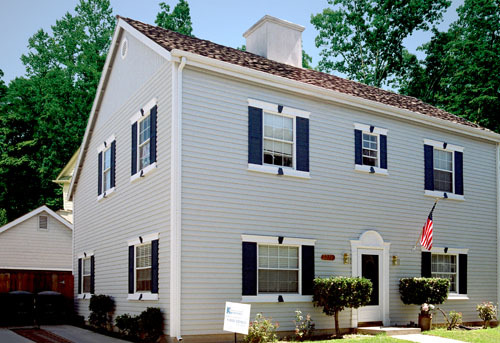 The home shown in the image has a few simple design elements added to the original siding/window remodel project. The windows have headers and keystones (both above and below) and shutters. The main entrance door has pilasters on either side, with a half round over the top, and a new set of carriage lamps. If you are ready to increase your home’s curb appeal give K-Designers a call 800-728-3902 or visit us online www.k-designers.com and we’ll walk you through all of these options and more.